Hidden Riches is a Real Series release from Real Time Gaming. It is a video slot with 5 reels and 25 paylines. 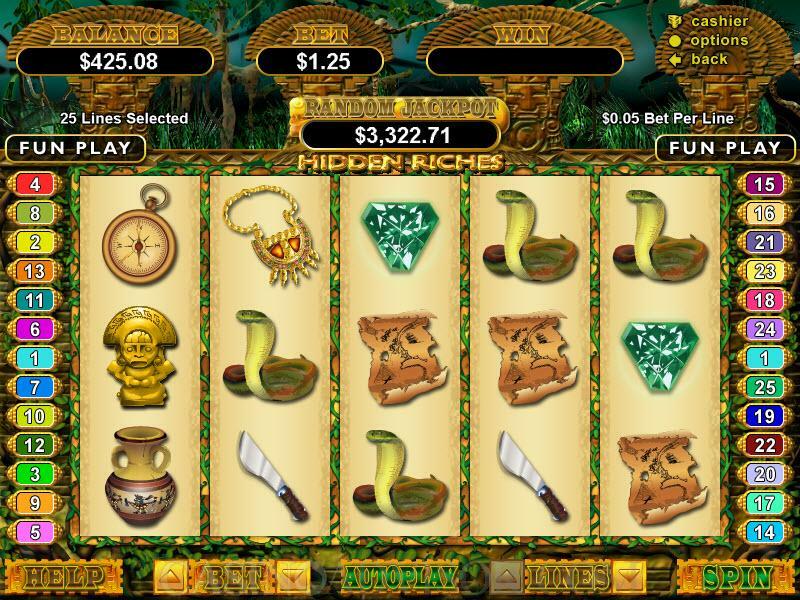 Hidden Riches has an Aztec theme and the hidden riches are the ancient Aztec treasures that the player has to find. On the reels the seekers are the Adventurer and the Girl. Some of the symbols on the reels are the tools that the Adventurer will need in order to find the treasure. These are the Compass, the Map and the Hatchet. The other symbols on the reels are typical Aztec icons, which include the Tablet, the Pyramid, the Idol, the Diamond, the Urn and the Necklace. The Snake guards the treasure. The Adventurer and the Tablet are animated when they offer payouts. In the animation of the Adventurer symbol the background becomes alive, but the movement is barely perceptible. The animation of the Tablet symbol is more pronounced. It lights up and starts spinning. Drum and pipe tribal music accompanies the animations and also the free spins. There is no music in the normal spins. Players have to select the number of paylines and coin denomination. Since winning combinations count only on active paylines it is advisable to enable all 25 paylines. The coin denomination selection depends on the players’ bankrolls. Hidden Riches offers denominations starting at 0.01 and going up to 5.00. Players do not have any choice in the number of coins per payline. That parameter is deemed to be unity. The Adventurer is the wild symbol. It appears only on reels 1, 3 and 5. It offers a line payout of 2 coins when it appears on reel 1. 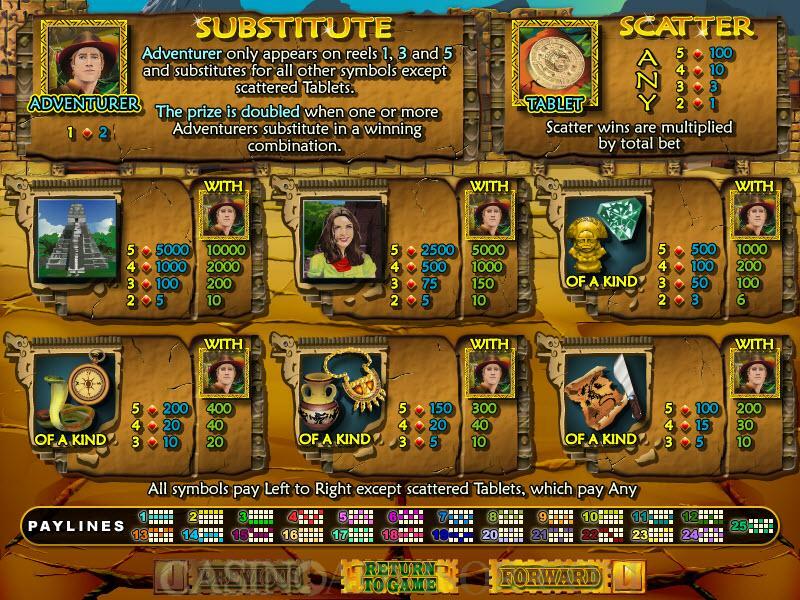 However the Adventurer doubles all payouts when it helps make a winning combination. The Tablet is the scatter symbol. 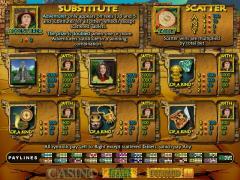 It offers scatter payouts when two or more appear anywhere on the reels. The scatter payout for five Tablet symbols is 100 coins. The largest fixed jackpot is offered by the Pyramid. When the jackpot is hit without the help of a wild symbol the payout is 5000 coins. 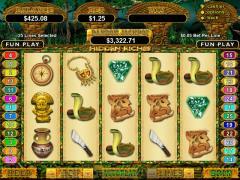 Two wild symbols offer 5 free spins and three wild symbols offer 25 free spins. When the free spins are triggered the player is taken through dense foliage to a new set of reels. The background to the symbols is dark and there are no scatter symbols. Music composed of drum beats and pipe instruments is played. All payouts are tripled in these rounds. However, the most interesting feature is the Mystery Feature, which is triggered by three or more scatter symbols. The feature takes players to the Adventurer’s Circle that consists of five prize symbols and a bonus round. A light flashes around the circle and comes to a stop on one of the six points. The first prize symbol to be matched three times offers bonus credits, which can be up to 2000 times the triggering bet. If the bonus round it hit before any symbol is matched thrice then it will award another round. Interested in reading more detailed information about Hidden Riches? If so Click Here for more details.